Why should you buy our beef? SAVE MONEY...Lower your cost by buying your beef in bulk directly from us, the farmer. By eliminating numerous middle men between the farmer and the grocery store, we are able to provide beef for much cheaper than you can find in a supermarket. We encourage you to do your own price comparison between the estimates provided on this website and your grocery store. Our estimates show a savings of 20-25% when averaging the cost across all cuts of meat (steak, beef roast, ground beef, etc. ), particularly when comparing to other hormone-free, grass-fed beef. HEALTHIER CHOICE...Our beef is a unique breed proven to be among the healthiest beef available. DELICIOUS...You will enjoy the excellent flavor of our beef. The unique breed of beef cattle that we raise score very high in taste test comparisons. We love the way our beef tastes, and we’re sure you will too! 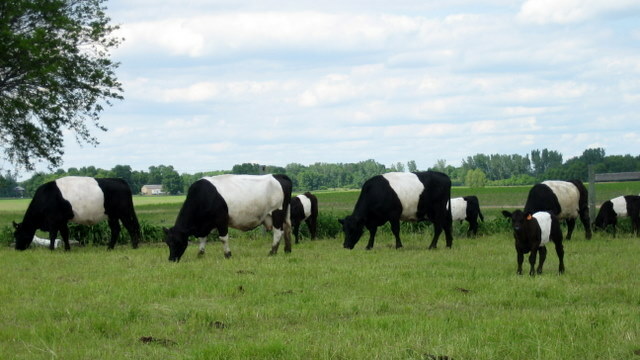 See Belted Galloway Beef is Low in Fat, High in Flavor! for full study. WE TREAT OUR ANIMALS WITH RESPECT...You can rest easy knowing our animals receive the individual attention they deserve. We always take extra care when moving, handling, and processing our cattle. Our beef cattle are separated into multiple groups that are rotated through several pastures so there’s always plenty of space for them. We’re a very modest-sized, family farming operation so overcrowding is not a problem for our cattle; each gets the care and attention it needs and deserves. BUY LOCAL...buying local is better for your community and for the environment. Choosing to buy from local, independently owned businesses is beneficial to your community and the environment. Less fossil fuels are needed to transport the food, over packaging is not required for the shorter trips, and the money you spend is circulated right back into the community, which helps to strengthen the local economy. These are huge benefits when you consider the average meal travels over 1,300 miles to get to your plate.